Monday, May 1, was the day for my first Alvin dive. I was full of excitement and should not get disappointed. It even exceeded all my expectations and was truly an experience of a lifetime. 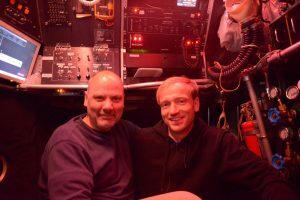 After climbing into the submarine at 8:00 in the morning, we were lifted off the deck of the R/V Atlantis and lowered into the ocean. Support swimmers, sitting on top of the sub while being lifted into the water, detached the lines that were connecting us to the ship and did the final safety check. Then the journey began, to the deep, dark, bottom of the ocean. I could hardly wait. On-board of dive #4898 were the experienced pilot Pat Hickey (more than 680(!) dives), starboard observer and chief scientist Stefan Sievert and myself. The sphere of Alvin is actually quite spacious and provided enough room for stretching legs – one person can even stand at a time. On each side of the sub, mine was the starboard side, are two small round windows to look out of and another out front, overlapping with the pilot. We could control cameras that allowed us to look around and record what we were seeing. On the way down with a speed of ~30 meters per minute, we were first moving through sunlit, clear, and blue water. Some smaller jelly fish and zooplankton were passing by the viewports, but there were not too many organisms to see due to the oligotrophic conditions in this area. But then, below the illuminated zone, as darkness descends, the water became alive with displays of bioluminescence – tiny flashes of lights produced by organisms using a chemical reaction. It felt like moving through an ocean of stars and it was more beautiful than I had expected. Suddenly, when we entered the oxygen minimum zone, we were enveloped by nothing but darkness until we reached the deeper oxygenated waters, which revealed a dazzling display of bioluminescence again. I kept starring outside the little windows almost the whole way down and was seldom so calm and full of joy. Collecting rock samples at Crab Spa, a vent emitting vent fluids with a temperature around 25ºC. At the bottom (~2500 m below sea level), the lights of the sub were switched on and the work began. 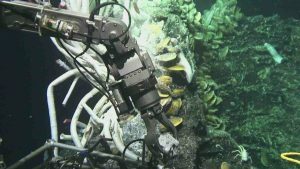 Equipped with giant robot arms, which were controlled by Pat as they were his own, and a number of samplers and sensors, fluid, rock and biological samples can be collected. For safety reasons, we landed off-axis on a relatively plain pillow lava field. Here, we picked up a previously deployed instrument, the large volume pump, which allows to filter a large amount of vent fluids in situ, and made us on the way to our first station named Teddy Bear. When we entered the hydrothermal vent field, the landscape became rough with ridges of basalt, small chimneys, and cracks in the basaltic crust. It was like flying through a canyon in walking speed. White vent crabs were sitting on the black basalt and although they are blind, it seemed they were staring at us just like I was staring at them. Sampling of hot vent fluids at Q Vent. 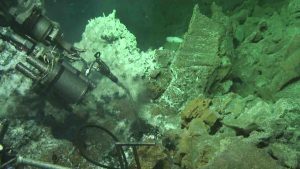 At the vent sites, hydrothermal fluid discharges are seen as shimmering water. Armed with a handful of water samples, we were after these fluids. 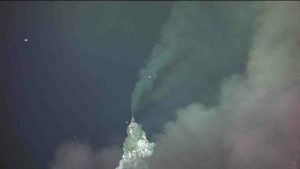 Reduced chemical species that are vented at deep-sea hydrothermal systems support diverse microbial populations that are independent of sunlight and participate in important biogeochemical processes. Back in the lab, chemical and molecular analysis will provide insight about microbial identities, microbial metabolisms as well as adaptation to this extreme environment. So we basically aim to answer the questions: Who is there, how many, and what are they doing? These chemosynthetic organisms provide the basis of the food web at deep sea vents, which are often surrounded by flourishing life, including white crabs, Riftia tubeworms, vent mussels, vent shrimps, and long white fish. The top of P vent, a towering black smoker that’s about 13 m tall. I was really astonished by the abundance and diversity of life that we saw at several of the visited sites and now fully understand why hydrothermal vent fields are often called oases on the ocean floor. At the end of our dive, we made our way to a vent field named Bio9 and P Vent. Here, we explored black smokers – more than 10 m high, roughly cylindrical chimney structures that emit a cloud of black, superheated (we measured 366 °C at Bio9) material. These are probably the most impressive deep-sea vent features and it was just amazing seeing these structures with my own eyes. After five hours on the seafloor and with all science objectives completed, we ascended to the surface and Alvin was craned backed onto the ship. Our colleagues were already waiting and I received the traditional ice water bucket bath for first-time Alvin divers. I have enjoyed every single minute and would not hesitate a millisecond to go on another dive. I am very grateful for this opportunity.